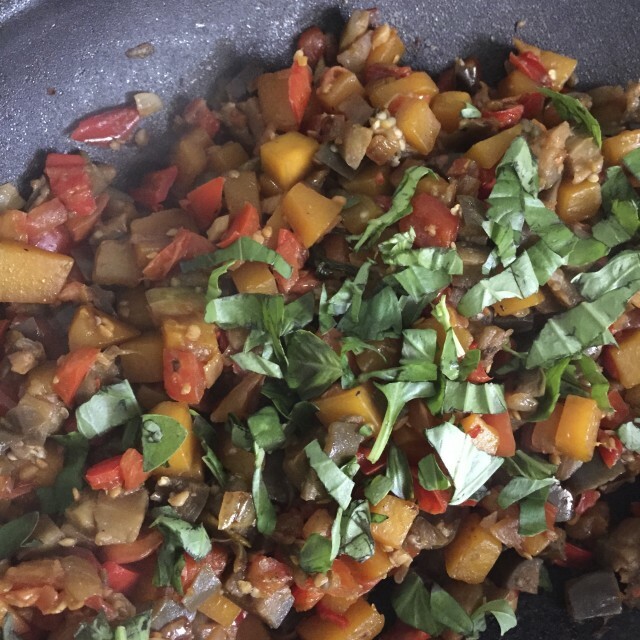 Ratatouille is a comforting dish. 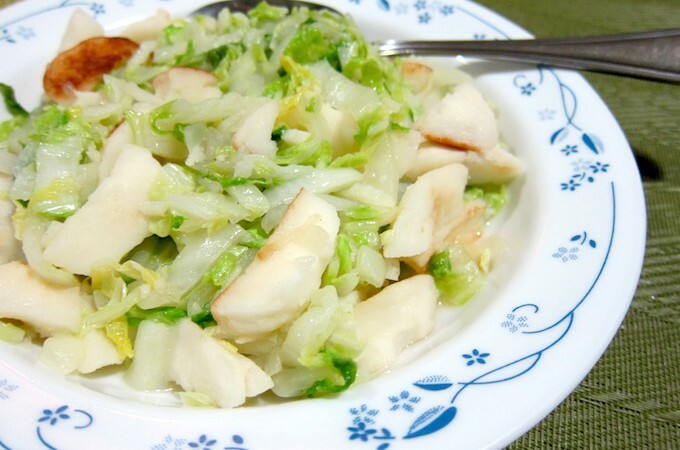 You can eat it as a main meal, but I’ve come to like it as a side dish or a topping on pieces of toasted bread. 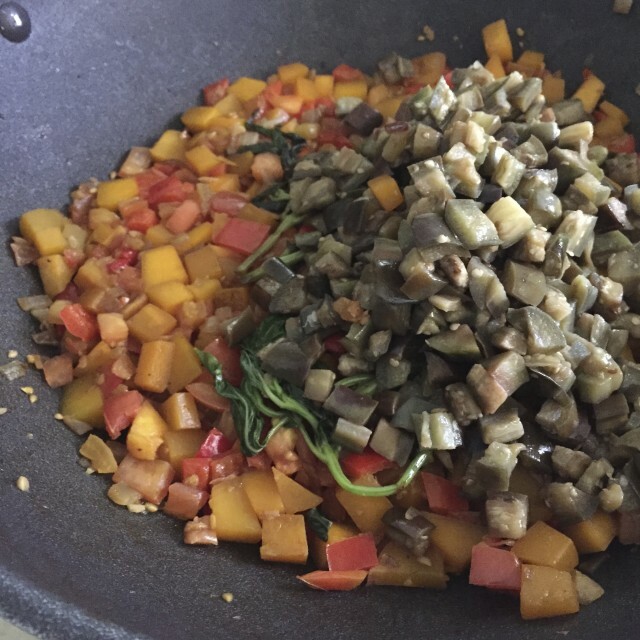 Here’s how I make ratatouille. 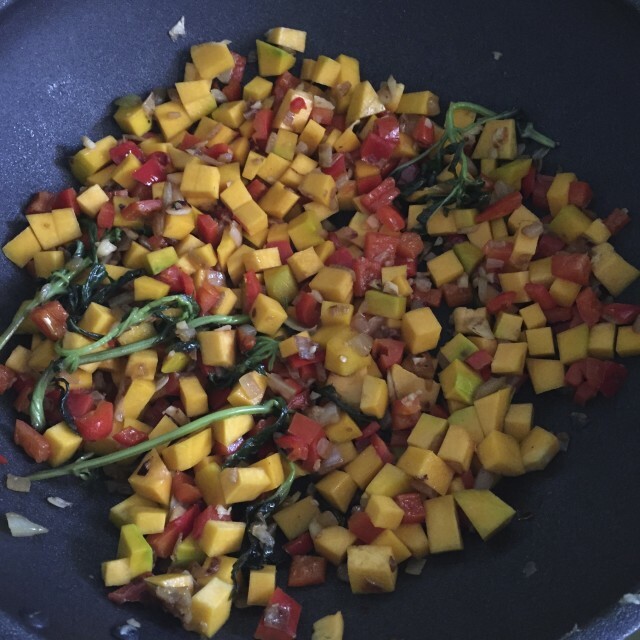 The bulk of the preparation is in cubing the veggies, so I suggest that you prepare this on a leisurely morning! 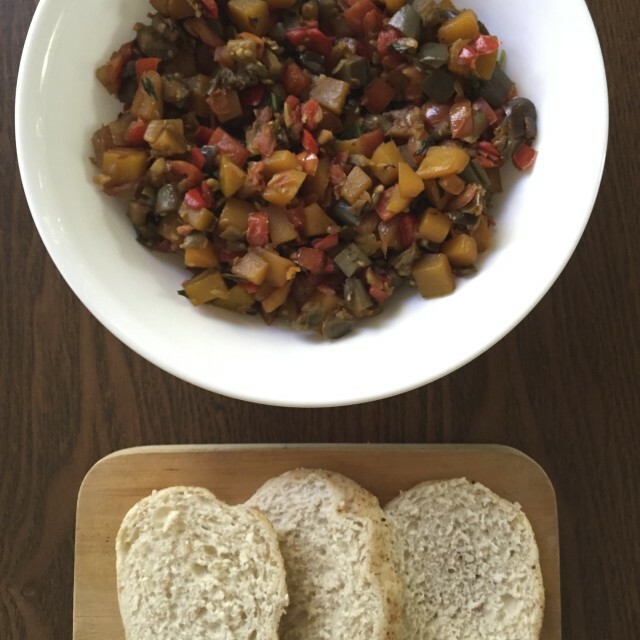 This recipe is adapted from Alice Waters’ Ratatouille Recipe on Food52. I was inspired to follow it because it seemed so simple! And it was. The first thing you do is sprinkle a teaspoon of salt over 2 small eggplants (cubed). Put the cubed eggplants in a colander and let it drain for about 20 minutes. (I totally forgot to take a picture of that.) Pat the eggplant dry. When that’s done, put two tablespoons of olive oil in a heated pan. 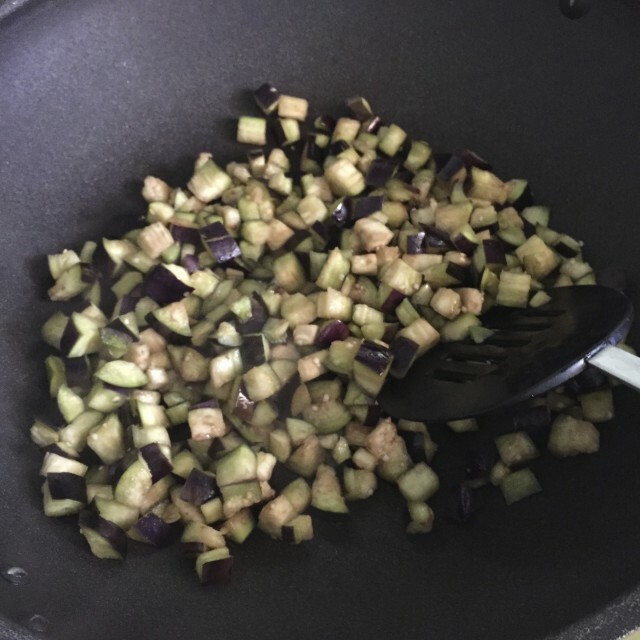 Add the eggplant into the pan and cook, stirring frequently. 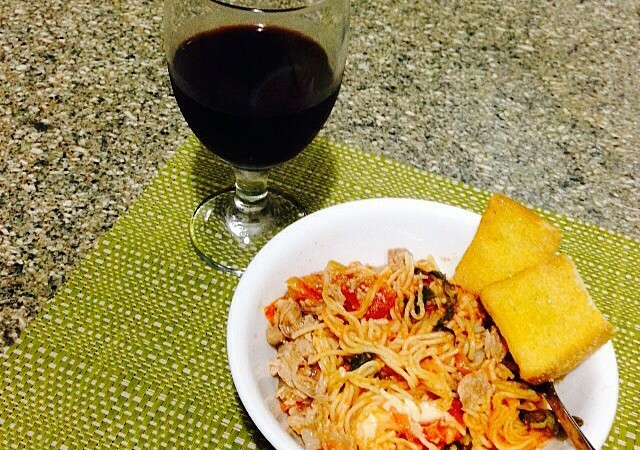 When done, remove the eggplant and set aside. 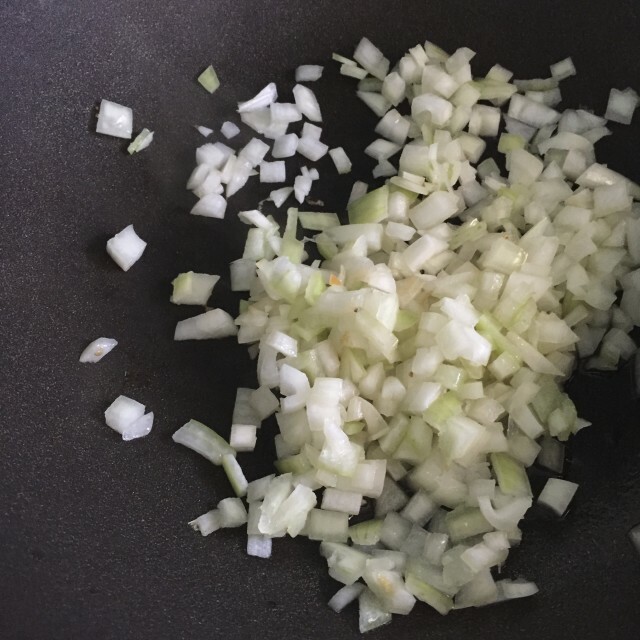 In that same pan, add 1 big white onion that has been diced. Cook till translucent. 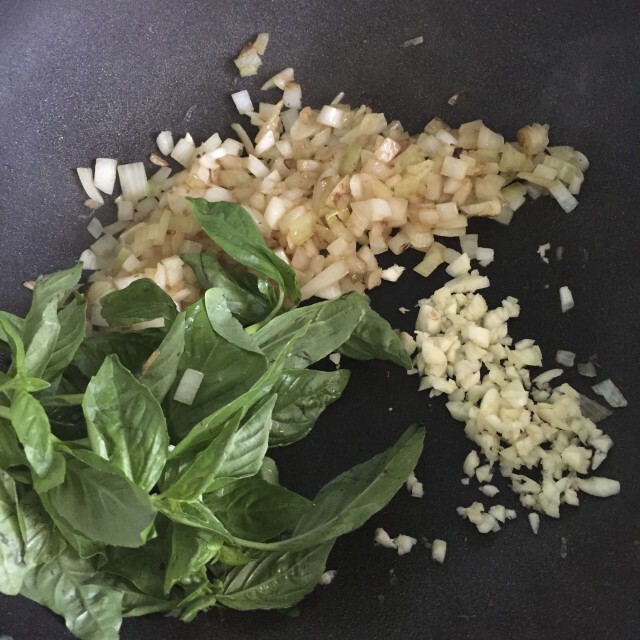 Next, add chopped garlic (about 6 cloves), a basil bouquet, dried chili flakes and salt. I didn’t have a basil bouquet so I just put in a whole stalk of basil. Heehee. It worked anyway. I think! 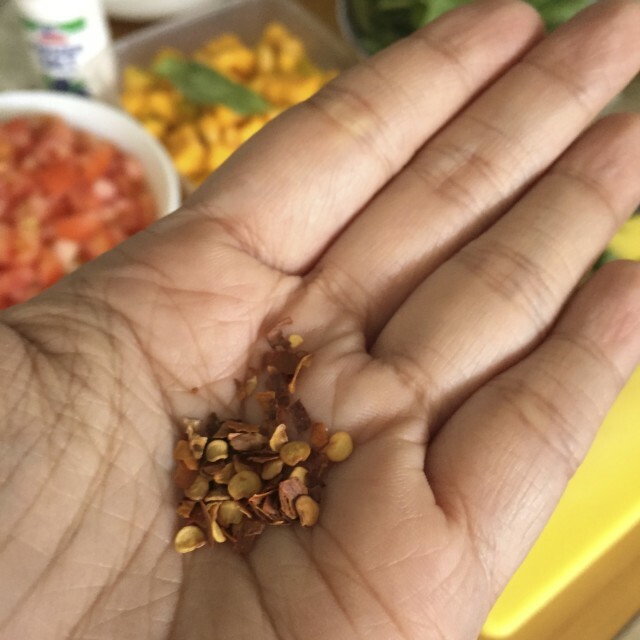 Now I didn’t have dried chili flakes in the pantry, but remembered we have leftover packs of dried chili flakes from a pizza delivery awhile back! 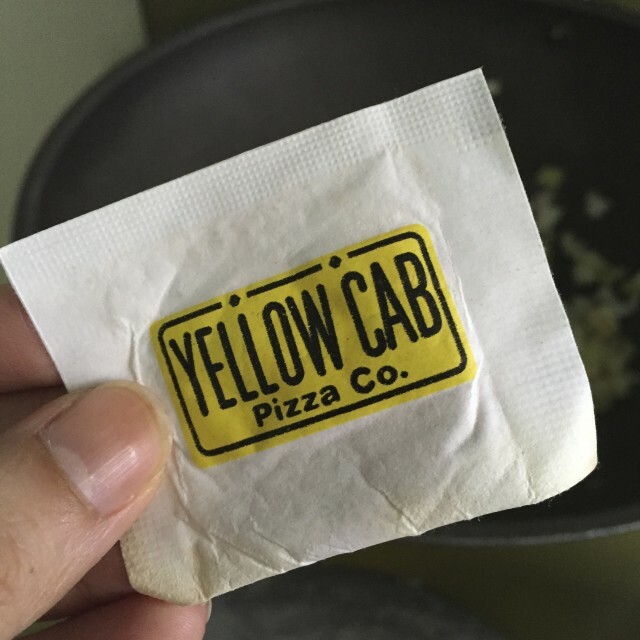 Thank you Yellow Cab! Whew! 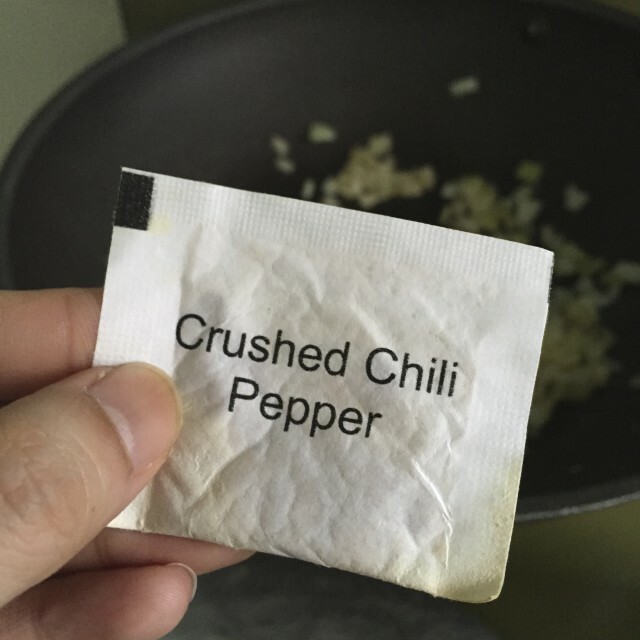 So cook that for about 5 minutes. Then stir in diced red bell peppers (about 2 small pieces). 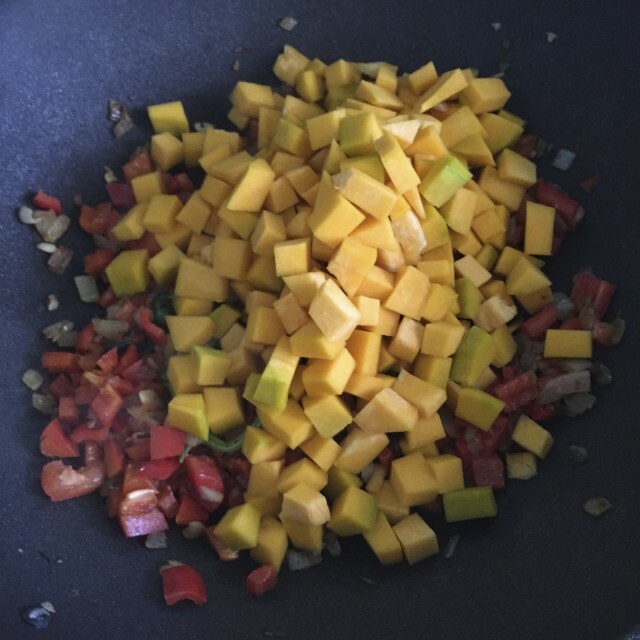 Cook for few more minutes, then add the cubed squash. The Food52 recipe called for 3 medium summer squash. I used about two since we’re not big squash people at home. Cook for a few more minutes. 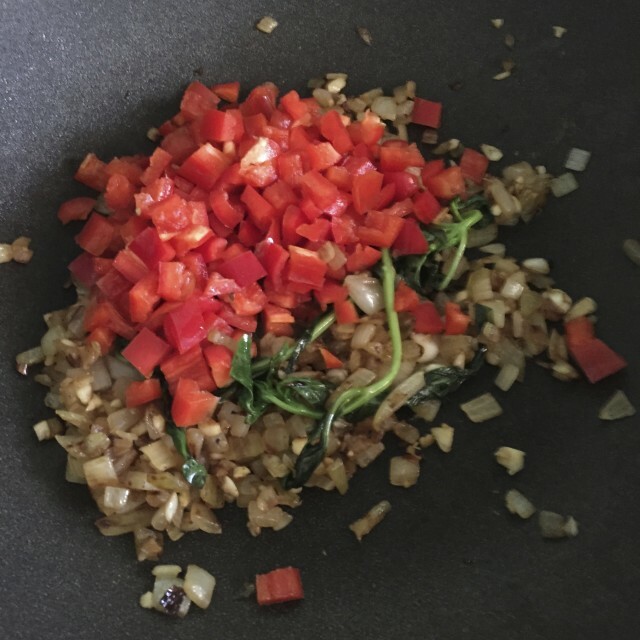 Then add 3 tomatoes, diced. Just keep stirring everything together, about 10 minutes. At this point I was thinking, man, this dish is taking forever to cook!! But good things come to those who wait, right? 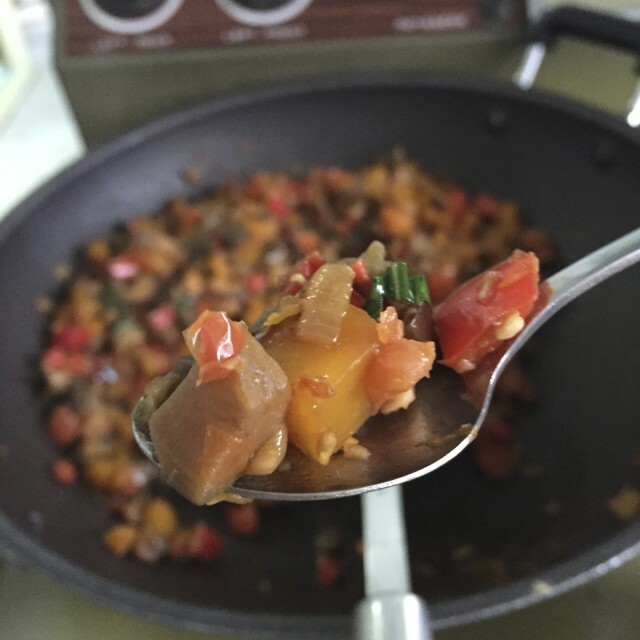 When 10 minutes is up, stir in the eggplant you put aside. Cook for about 15 minutes more, until all the vegetables are soft. In my case, the basil stalks. 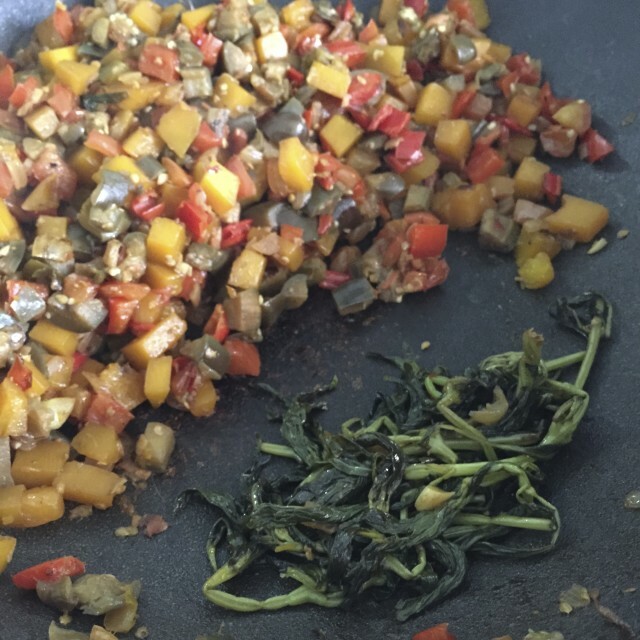 Stir in a handful of chopped basil leaves and add more olive oil and salt to taste. Ta-da! You are FINALLY done. But it’s worth the wait! 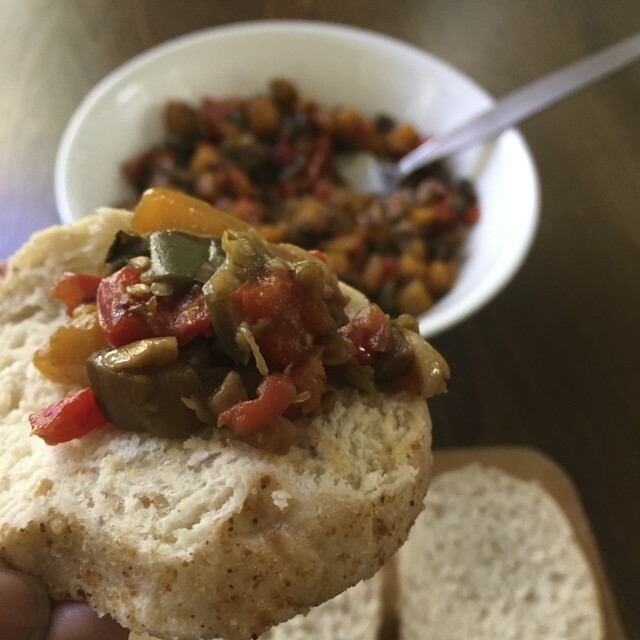 Grab a few pieces of toasted, crusty bread and you’re good to go for an appetizer, a side dish or an afternoon snack. Yum! 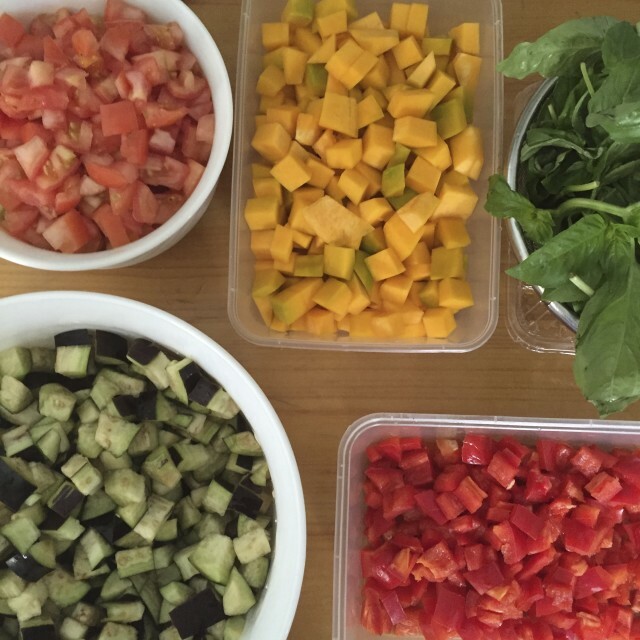 Healthy, tasty, easy to prepare ratatouille. Enjoy!